1 ACCIDENT INSURANCE CLAIM ReliaStar Life Insurance Company A member of the ING family of companies Administered by: Key Benefit Administrators, Inc., P.O. Box 1238 Fort Mill, SC Phone: , Fax: Your future. Made easier. SM To File A Claim: Complete Sections 1,2 and 3 Attach an itemized bill and submit the Claim Form with the itemized bill attached to the address above. If you were hospitalized as a result of this accident, you must include a copy of the hospital bill indicating your diagnosis and number of days hospitalized. We will require a copy of the police report for all motor vehicle accident claims and any other incidents investigated by any law enforcement agency. If death was a result of the accident, please include a certified copy of the death certificate for the deceased. 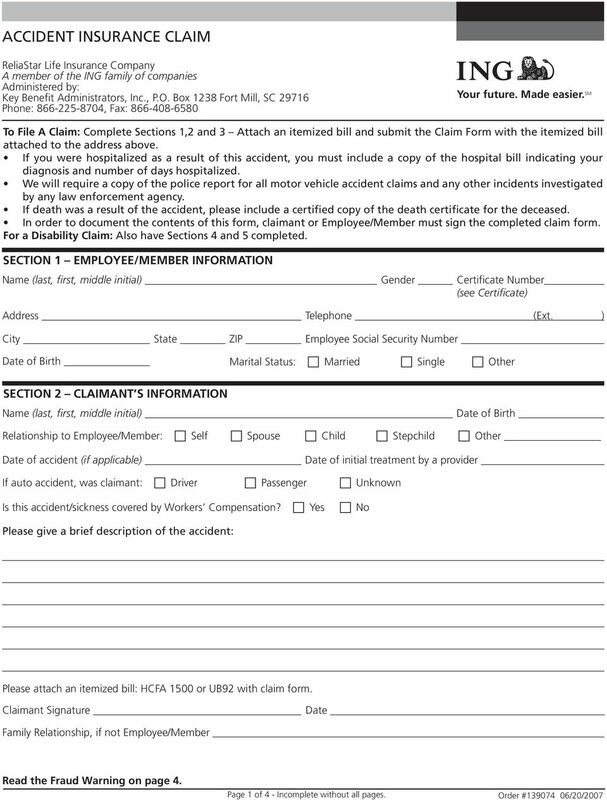 In order to document the contents of this form, claimant or Employee/Member must sign the completed claim form. For a Disability Claim: Also have Sections 4 and 5 completed. SECTION 1 EMPLOYEE/MEMBER INFORMATION Name (last, first, middle initial) Gender Certificate Number (see Certificate) Address Telephone (Ext. ) City State ZIP Employee Social Security Number of Birth Marital Status: Married Single Other SECTION 2 CLAIMANT S INFORMATION Name (last, first, middle initial) of Birth Relationship to Employee/Member: Self Spouse Child Stepchild Other of accident (if applicable) of initial treatment by a provider If auto accident, was claimant: Driver Passenger Unknown Is this accident/sickness covered by Workers Compensation? Yes No Please give a brief description of the accident: Please attach an itemized bill: HCFA 1500 or UB92 with claim form. Claimant Signature Family Relationship, if not Employee/Member Page 1 of 4 - Incomplete without all pages. 2 Employee/Member Name Claimant Name (If other than Employee/Member) SECTION 3 AUTHORIZATION AND ACKNOWLEDGMENT For claim purposes, I give my permission to: Any physician or other medical practitioner, hospital, clinic, other medical or medically related facility, insurance or reinsurance company, Medical Information Bureau, Inc.(MIB), Social Security Administration or employer to give ReliaStar Life Insurance Company (ReliaStar Life) or its agents, employees and authorized representatives acting on its behalf (including ChoicePoint or any consumer reporting agency), ALL INFORMATION on my behalf (except as limited below), including findings on medical care, psychiatric or psychological care or examination, surgery or non-medical information regarding Social Security benefits or earnings information and other employment-related information, as they apply to me. I give my permission to ReliaStar Life to get consumer or investigative consumer reports about me. I give my permission to ReliaStar Life to get any and all such information for the purposes described in this form. I specifically consent to the redisclosure of such information as set forth in this form. I know that my medical records, including any alcohol or drug abuse information, may be protected by Federal Regulations 42 CFR Part 2. I may revoke this authorization as it applies to any information protected by 42 CFR Part 2 at any time, but not to the extent action has been taken in reliance on it. I understand all or part of the information obtained by this authorization may be communicated between ReliaStar Life and its affiliates and may be sent to MIB. This information may be made available to any ReliaStar Life affiliate, reinsurer, employee, or contractor who processes transactions that concern any coverage I may have requested or have with ReliaStar Life or its affiliates. I understand that my additional written consent will be required before any information described above is given, sold, transferred, or, in any way, relayed to another party not previously specified (unless otherwise provided by law). My additional consent must be provided on a form that states the new use of the information or why another party needs it. I know that I or my authorized representative have the right to get a copy of this form. A photocopy of this form will be as valid as the original. This authorization will be valid for the duration of my claim for benefits. 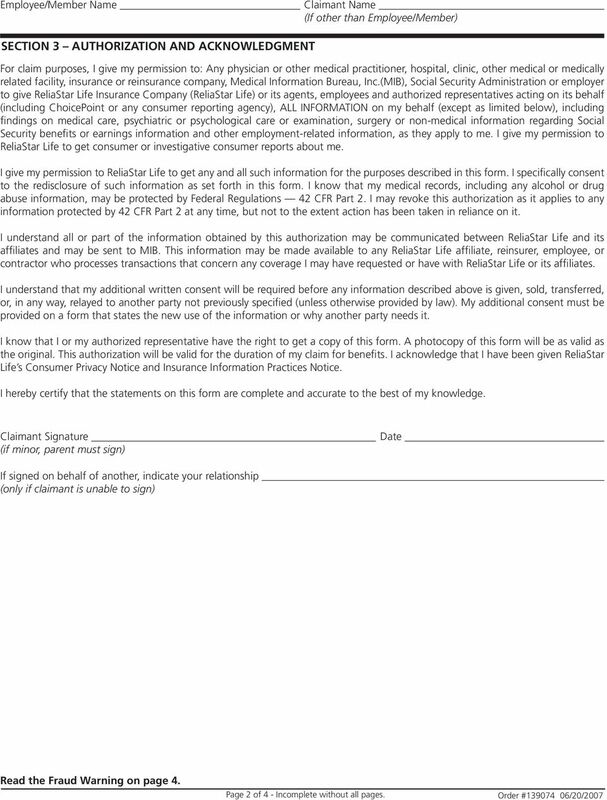 I acknowledge that I have been given ReliaStar Life s Consumer Privacy Notice and Insurance Information Practices Notice. I hereby certify that the statements on this form are complete and accurate to the best of my knowledge. Claimant Signature (if minor, parent must sign) If signed on behalf of another, indicate your relationship (only if claimant is unable to sign) Page 2 of 4 - Incomplete without all pages. 3 Employee/Member Name Failure to complete this form in its entirety may result in a delay in processing this claim. 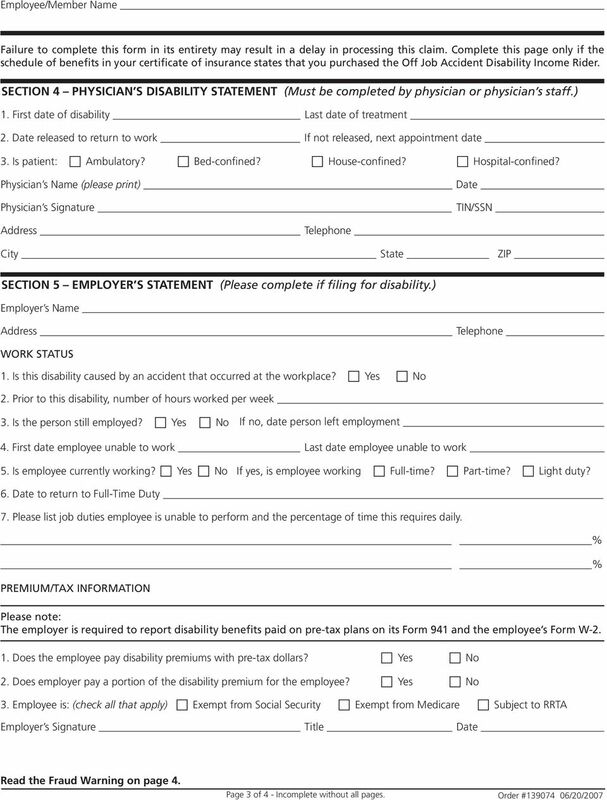 Complete this page only if the schedule of benefits in your certificate of insurance states that you purchased the Off Job Accident Disability Income Rider. SECTION 4 PHYSICIAN S DISABILITY STATEMENT (Must be completed by physician or physician s staff.) 1. First date of disability Last date of treatment 2. released to return to work If not released, next appointment date 3. Is patient: Ambulatory? Bed-confined? House-confined? Hospital-confined? 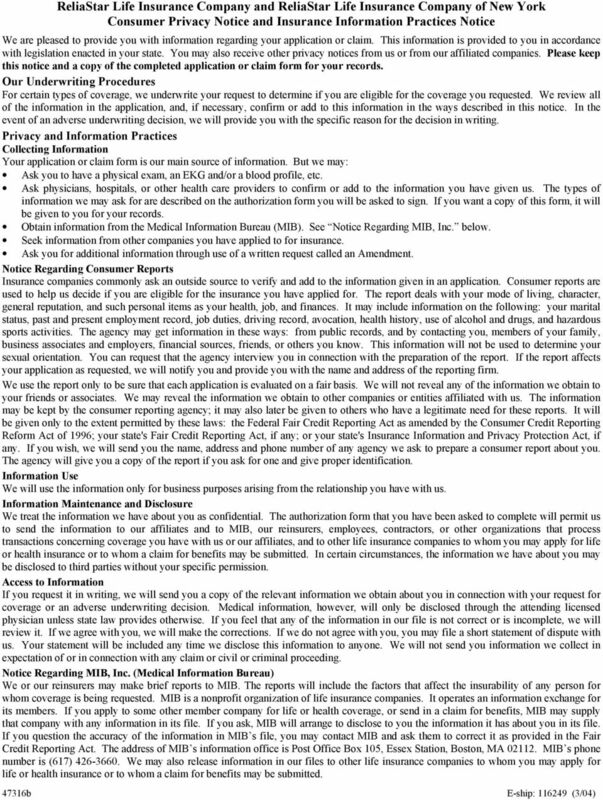 Physician s Name (please print) Physician s Signature TIN/SSN Address Telephone City State ZIP SECTION 5 EMPLOYER S STATEMENT (Please complete if filing for disability.) Employer s Name Address Telephone WORK STATUS 1. Is this disability caused by an accident that occurred at the workplace? Yes No 2. Prior to this disability, number of hours worked per week 3. Is the person still employed? Yes No If no, date person left employment 4. First date employee unable to work Last date employee unable to work 5. Is employee currently working? Yes No If yes, is employee working Full-time? Part-time? Light duty? 6. to return to Full-Time Duty 7. Please list job duties employee is unable to perform and the percentage of time this requires daily. % % PREMIUM/TAX INFORMATION Please note: The employer is required to report disability benefits paid on pre-tax plans on its Form 941 and the employee s Form W Does the employee pay disability premiums with pre-tax dollars? Yes No 2. Does employer pay a portion of the disability premium for the employee? Yes No 3. Employee is: (check all that apply) Exempt from Social Security Exempt from Medicare Subject to RRTA Employer s Signature Title Page 3 of 4 - Incomplete without all pages. 4 Fraud Warning Notice Alaska, Arkansas, Delaware, Idaho, Indiana, Louisiana, Maine, Minnesota, New Mexico, Ohio, Oklahoma, Oregon, Tennessee, Texas, Washington, West Virginia Arkansas California Colorado District of Columbia Florida Kentucky New Hampshire New Jersey Pennsylvania Puerto Rico Any person who, knowingly with intent to defraud any insurance company or other person files a statement of claim containing any materially false information or conceals, for the purpose of misleading, information concerning any fact material thereto commits a fraudulent insurance act, which is a crime, and may subject such person to criminal and civil penalties, and denial of insurance benefits. For your protection Arizona Law requires the following statement to appear on this form. Any person who knowingly presents a false or fraudulent claim for payment of a loss is subject to criminal and civil penalties. For your protection, California law requires the following to appear on this form. Any person who knowingly presents false or fraudulent claim for the payment of a loss is guilty of a crime and may be subject to fines and confinement in state prison. It is unlawful to knowingly provide false, incomplete, or misleading facts or information to an insurance company for the purpose of defrauding or attempting to defraud the company. Penalties may include imprisonment, fines, denial of insurance, and civil damages. 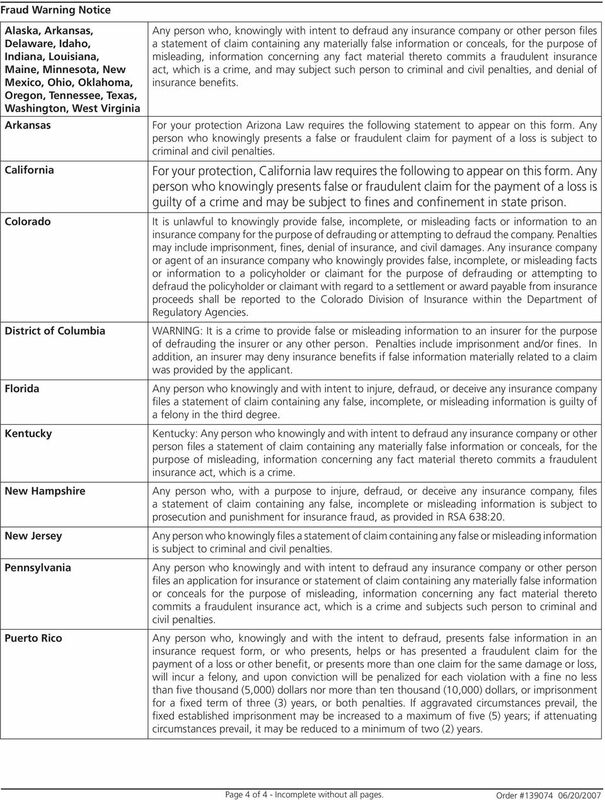 Any insurance company or agent of an insurance company who knowingly provides false, incomplete, or misleading facts or information to a policyholder or claimant for the purpose of defrauding or attempting to defraud the policyholder or claimant with regard to a settlement or award payable from insurance proceeds shall be reported to the Colorado Division of Insurance within the Department of Regulatory Agencies. WARNING: It is a crime to provide false or misleading information to an insurer for the purpose of defrauding the insurer or any other person. Penalties include imprisonment and/or fines. In addition, an insurer may deny insurance benefits if false information materially related to a claim was provided by the applicant. Any person who knowingly and with intent to injure, defraud, or deceive any insurance company files a statement of claim containing any false, incomplete, or misleading information is guilty of a felony in the third degree. Kentucky: Any person who knowingly and with intent to defraud any insurance company or other person files a statement of claim containing any materially false information or conceals, for the purpose of misleading, information concerning any fact material thereto commits a fraudulent insurance act, which is a crime. Any person who, with a purpose to injure, defraud, or deceive any insurance company, files a statement of claim containing any false, incomplete or misleading information is subject to prosecution and punishment for insurance fraud, as provided in RSA 638:20. Any person who knowingly files a statement of claim containing any false or misleading information is subject to criminal and civil penalties. Any person who knowingly and with intent to defraud any insurance company or other person files an application for insurance or statement of claim containing any materially false information or conceals for the purpose of misleading, information concerning any fact material thereto commits a fraudulent insurance act, which is a crime and subjects such person to criminal and civil penalties. Any person who, knowingly and with the intent to defraud, presents false information in an insurance request form, or who presents, helps or has presented a fraudulent claim for the payment of a loss or other benefit, or presents more than one claim for the same damage or loss, will incur a felony, and upon conviction will be penalized for each violation with a fine no less than five thousand (5,000) dollars nor more than ten thousand (10,000) dollars, or imprisonment for a fixed term of three (3) years, or both penalties. If aggravated circumstances prevail, the fixed established imprisonment may be increased to a maximum of five (5) years; if attenuating circumstances prevail, it may be reduced to a minimum of two (2) years. Page 4 of 4 - Incomplete without all pages.